As Minister of Employment, Workforce Development and Labour, I am pleased to present the Departmental Plan for 2017-2018 for the Canadian Centre for Occupational Health and Safety (CCOHS). Every worker in Canada deserves to be safe at work. CCOHS promotes the health and well-being of the working population in Canada by providing information, education, and tools that help prevent occupational injury and illness. While physical injuries may seem like the most obvious threat in workplaces, the mental health and well-being of workers is equally as important. Our efforts to identify and address workplace hazards must include non-physical hazards such as harassment and psychological health and safety. We recognize that this may require a shift in or changes to workplace cultures. Canada’s workplaces are among the safest in the world. When workers are in good physical and mental health, they are more productive and contribute more fully to our economy and to our society. CCOHS partners and collaborates with agencies and organizations from across Canada and around the world to meet the changing needs of workers and workplaces. CCOHS and the Labour Program work closely with unions, employers, employees and other governments to ensure that workers of all ages understand the hazards in their workplaces, and how to remain well at work. I look forward to continuing our work with CCOHS to help create safe, healthy, productive workplaces and improve the lives of workers in Canada. Everyone would agree that workplaces should be safe and workers should be protected from injury and illness. CCOHS has a role to play in equipping workers and workplaces with the information and tools they need for safe work. We will continue to improve our national presence and increase awareness of relevant health and safety issues and prevention information that we make available to the public. CCOHS will continue to work closely with unions, employers, and governments to create solutions that help address the hazards in their workplaces. Through our educational, outreach and communications initiatives, CCOHS will increase awareness of health and safety to more of the Canadian population than ever before, to help make workplaces safer and educate workers about their rights to, and responsibilities for, safe work. CCOHS will continue to partner with jurisdictions and other health and safety organizations to develop educational resources and technical solutions that address their needs and increase the impact to Canadians. By focusing on injury and illness prevention, CCOHS can support the fundamental right of all Canadians to a healthy and safe workplace. 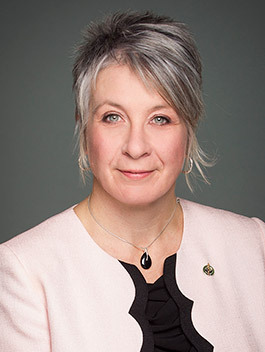 These priorities align with our Mandate and our Vision to promote health and safety in the workplace; facilitate participation by labour and management; develop programs to eliminate hazards; and provide credible information, education and innovative solutions to create positive changes in the lives of working people in Canada. The end game is really about affecting positive change in the workplace culture and as such we remain committed to delivering products and services and solutions that further that imperative. We look forward to another positive impactful year. CCOHS' goal is to improve its national profile and increase awareness of relevant workplace health and safety issues and prevention information as well as the products and services it offers to the public. We believe that although awareness is the first step, equipping people with the information, tools and solutions they need to work safely and create healthy and safe workplaces will affect change that will result in reductions in work-related illness, injuries and death. CCOHS plans to continue to run multifaceted communications campaigns using webcasts, podcasts, social media, newsletters and media to increase awareness of health and safety and therefore, CCOHS and its programs and solutions. CCOHS recognizes that partnerships are essential for collaboration in advancing workplace health and safety. CCOHS will continue to partner with the provinces and territories and other health and safety organizations to develop educational resources and technological solutions that address the needs of the jurisdictions and increase the impact to Canadians. CCOHS will continue to provide leadership in addressing current workplace health and safety issues related to high risk groups and sectors such as mental health, young workers, and sectors such as construction, transportation, and mining. CCOHS will lead the development of an immersive educational experience to help prepare young people for the world of work and collaborate with industry organizations to develop solutions to meet their health and safety needs. These initiatives help raise the national profile of the Centre and increase the number of Canadians impacted by its work. CCOHS will continue as a contributor and participant on national committees and initiatives as well as internationally as a World Health Organization (WHO) Collaborating Centre to raise the national profile of the Centre. CCOHS offers a selection products and services on a cost recovery basis to meet the needs of Canadian workplaces. An improved cost recovery program will enable the organization to reinvest those resources to develop new innovative solutions, including free public services, which will ultimately lead to safer workplaces in Canada. During 2017-18, CCOHS plans to continue to develop new partnerships to address health and safety issues in high risk sectors and enhance utilization of current products and services. CCOHS will increase its partnerships with health and safety organizations in each jurisdiction as well as industry associations, broadening the reach of CCOHS to include more Canadian workplaces. This helps ensure that more people benefit from good practises in workplace health and safety. For more information on the Canadian Centre for Occupational Health and Safety’s plans, priorities and planned results, see the "Planned results" section of this report. CCOHS functions as an independent departmental corporation under Schedule II of the Financial Administration Act and is accountable to Parliament through the Minister of Employment, Workforce Development and Labour. Its funding is derived from a combination of appropriations, cost recoveries and collaboration with the provinces. It is expected that a portion of the budget will be funded through cost recoveries from the creation, production, and worldwide sales of fee-for-service and revenue generating occupational health and safety products and services. CCOHS has experienced Governor-in-Council vacancies as many of our Governors terms have expired. We are expecting the situation to be resolved in 2017-18 however if the current trend continues it could have an impact on the Centre’s ability to deliver on its mandate. Occupational health and safety information development, delivery services and tripartite collaboration. Conference program: Participating in conferences across the country as exhibitors and presenters is an important way in which CCOHS creates awareness about current health and safety issues and the work they do, while establishing credibility with new and existing clientele. Regional and professional reach is extended by presenting and/or exhibiting in each region across the country, at approximately 42 events, focusing on high risk sectors such as mining, construction, transportation, healthcare, and Indigenous populations. This will result in increased impact to Canadians and improved national profile. Social Marketing campaigns: Connecting with Canadians through social media is one of the many ways CCOHS promotes a comprehensive approach to workplace health and safety. Through targeted paid and organic social media campaigns, from Government of Canada partnership and others, CCOHS can address current issues (such as mental health) and actively engage clients easily, across many channels, keeping CCOHS top of mind as the go to resource for tools, information, and advice on creating healthy workplaces. CCOHS’ campaigns will result in a raised national profile and an increased number of new users, reach and impact. Mental health: Depression, stress and other mental health issues are important workplace issues in Canada. CCOHS will continue to provide leadership on the issue of workplace mental health by providing reliable and credible mental health information and resources to workers and employers in Canada. The increased usage of resources from portals, workshops, and presentations will provide practical guidance for workplaces to affect positive change as well as extend reach and impact to Canadians by cultivating partnerships. Youth initiative: Young workers are new to the working world and can be unaware of the dangers, or their rights, in their workplace. CCOHS will develop a free immersive educational experience to prepare young people for the world of safe work, and that qualifies their knowledge. Over the next two years this initiative will increase the number of users of CCOHS material and raise the profile of the Centre through collaborations and partnerships with jurisdictions and other health and safety organizations. Easy access to CCOHS’ occupational health and safety information and services. Satisfaction with and ease of access and retrieval of occupational health and safety information from the Inquiries Service, web access and other CCOHS resources (such as our website, web portals, and presentations). Overall 80% or higher on client satisfaction survey, web statistics and evaluation data. March 31, 2018 82% satisfaction rate for Inquiries service. 23% increase in website usage. 99.7% overall satisfaction rate amongst CCOHS' Health and Safety Report newsletter readers. 93% overall satisfaction rate amongst CCOHS' Liaison newsletter readers. 89% satisfaction rate for Inquiries service. 13% increase in website usage. 99.5% overall satisfaction rate amongst CCOHS’ Health and Safety Report newsletter readers. 87% overall satisfaction rate amongst CCOHS’ Liaison newsletter readers. 87% satisfaction rate for Inquiries service. 99.4% overall satisfaction rate amongst CCOHS’ Health and Safety Report newsletter readers. 90% overall satisfaction rate amongst CCOHS’ Liaison newsletter readers. 42% increase in Canadian web sessions. Application of occupational health and safety information to improve workplace practices. Information is being applied in the workplace by employees, government and employers. Target of 72% using CCOHS information to make changes in the workplace. March 31, 2018 71.8% of Health and Safety Report readers use the information in the Report to make current or planned changes in their workplace that might improve occupational health and safety. 74% of Liaison readers use information from the newsletter to affect change in their workplace. 59% of users of CCOHS' free Inquiries service indicated their use of information will lead to current or future changes to the workplace. 67.9% of Health and Safety Report readers use the information in the Report to make current or planned changes in their workplace that might improve occupational health and safety. 70% of Liaison readers use information from the newsletterto affect change in their workplace. 59% of users of CCOHS’ free Inquiries service indicated their use of information will lead to current or future changes to the workplace. 70.7% of Health and Safety Report readers use the information in the Report to make current or planned changes in their workplace that might improve occupational health and safety. 72% of Liaison readers use information from the newsletter to affect change in their workplace. Increased awareness and understanding of health and safety issues in the workplace. Increase distribution of OHS information to employees and employers to improve their understanding of OHS. Increase distributions and usage of awareness information by 10%. March 31, 2018 34.5% increase in poster downloads. 18% increase in reach of CCOHS' Health and Safety Report newsletter. Over 1.7 million Canadians served with CCOHS' OSH Answers fact sheets (a free service) which represents a 21.4% increase. 69% increase in poster downloads. 12.5% increase in repurposed content. Planned Spending for 2017-18 is relatively flat and in line with historical spending levels. In 2014-15, the total spending illustrated included all Parliamentary appropriations and revenue sources including main estimates, supplementary estimates, respendable revenues and operating budget carry forwards reported using the former vote-netted revenue authority model, which nets revenues from expenditures. For the 2015-16 through 2019-20 periods, CCOHS is using a statutory revenue spending authority per Section 6 (1)(g) of the Canadian Centre for Occupational Health and Safety Act. On a true comparative basis, total planned net spending in 2017-18 is $4,577K versus $4,686K for 2014-15, which translates to a reduction of 2% from 2014-15 levels. 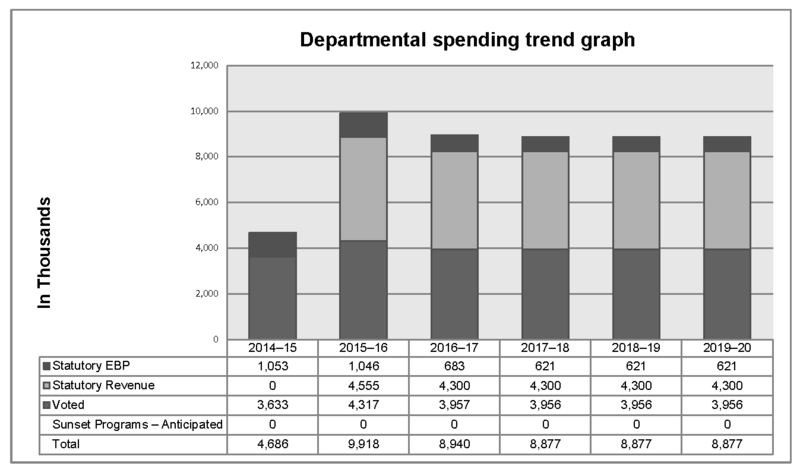 As illustrated in the Departmental Spending Trend graph and the related table, planned spending for the future periods is expected to remain relatively flat. The slight reduction beginning in 2017-18 is due to a frozen allotment to reduce spending on professional services. CCOHS is planning on growing the amount of products and services that it offers on both the public service side as well as the cost recovery side. As a result we expect staffing levels to increase as illustrated with the cost of the increase being offset by the increase in cost recovery revenues. Total expenses for 2017-18 are increasing slightly as we expect the Governor in Council appointment for the President and CEO early in the year. Total cost recovery revenues are also expected to rise slightly, which will offset a portion of the expense. As a result, the net cost of operations for 2017-18 is within 1.8% of the current 2016-17 forecast. Provides information on the plans and expected performance of appropriated departments over a three year period. Departmental Plans are tabled in Parliament each spring.